UPDATED GUIDE: Proximity Based Lighting #AdafruitLearningSystem « Adafruit Industries – Makers, hackers, artists, designers and engineers! 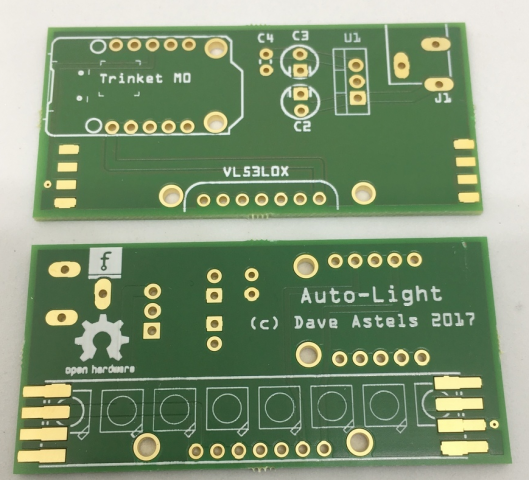 Dave Astels has updated his Proximity Based Lighting guide to include a nice new PCB board design. The guide uses a Trinket M0 and CircuitPython to make a remarkably flexible proximity LED light. You can find the updated guide here and order the new PCBs here. Have you made custom circuit boards for your project. Tell us your experiences in the comments!